There is parking by the building for about 15 cars and across the street behind the Shoreline Historical Museum in the grassy area but NOT in the paved area. For anyone who can’t climb the 6 stairs to get in the building from the parking spaces on the building side, they can enter at the front of the building on a ramp. General meeting dates and scheduled programs for 2019 - 2020. Meetings are held at the Richmond Masonic Center in Shoreline, just north of Seattle. An Encaustic Printmaker, Victoria embraces the Japanese wabi-sabi theory (or “perfectly imperfect”) in her abstracted collages and landscapes. The natural by-product of wrinkles, spots and blobs by working with melted wax are welcomed elements in her work, along with line, pattern and texture. 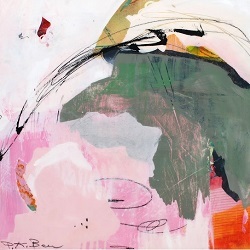 A right brain – left brain thinker, her work is a combination of active detail along with calm atmospheric fields. 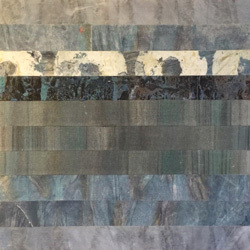 Her collage work may include encaustic prints, calligraphic strokes & mark-making, paper ephemera, book spines and her own abstract photographs. Visit her website. While not classified as a collage artist, Pam's work may contain elements of collage because anything goes when the creative process begins. Pam creates her own patterns, stamps, and colored papers for application during the process as needed. Representational or whimsical work begins with pattern and shapes that feel good. At times, a vague notion for the theme of the work is present when working in series. Inspiration may not only be color and pattern; but ideation, personality, and feelings. Most abstract work develops through a process of layering and textures, structure and looseness, lights and darks, and often a subtracting of layers until the visual dialog becomes stronger and the story solidifies. The NWCS will again be sponsoring the Collage Room at the Shoreline Arts Festival. The Festival location is moving to Shoreline Community College, 16101 Greenwood Ave N, Shoreline. There will be more space than ever! Come join the fun.Shoreline Arts Festival website.